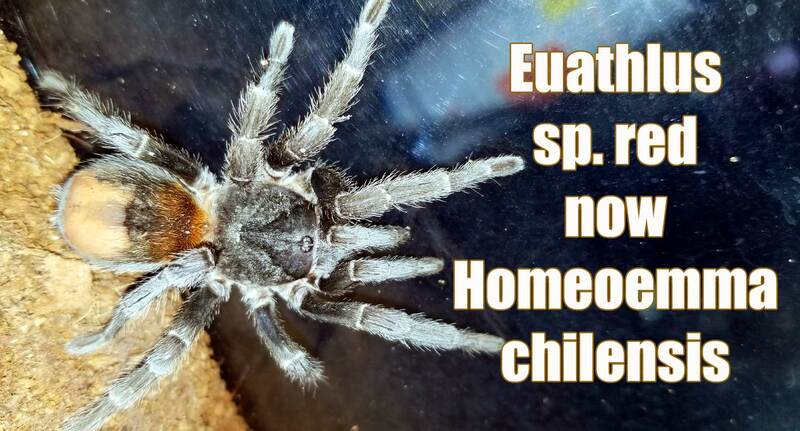 The new paper, First record of Homoeomma Ausserer, 1871 in Chile and description of two new species (Araneae, Theraphosidae) by Rubén Montenegro V., Milenko A. Aguilera & María Eugenia Casanueva brings with it significant changes for two of the hobby’s favorite little dwarf tarantulas. The species originally referred to as Eauthlus sp. “Red” or “Fire” is now Homoeomma sp. chilensis. The species originally referred to as Euathlus sp. “Yellow” is now Homoeomma orellanai. For those who have been in the hobby for a while, this news isn’t exactly shocking. Euathlus has long served as a bit of a “place holder” genus for spiders who have not been adequately described. The hobby staple, Brachypelma hamorii, for example, was once Euathlus smithi. It has long been thought that this species would be moved into the genus Homoeomma once it was properly studied and examined, and many vendors had already begun labeling them as Homoeomma sp. fire. Now, for changes like this to become truly “official”, the paper has to be published, peer reviewed, and accepted by the scientific community. With the paper having just been published this month, I’m not sure if this has happened yet. However, as with all name changes, word will spread quickly and many will have questions as to why this species is suddenly listed under another name. Vendors may also change the names on their websites, which can lead to some confusion. Personally, I’m excited about this new development. Anytime species get properly described, it’s a good thing for science AND the hobby. As always, there will be some folks who are reluctant to adopt the new name due mostly to sentimentality and a misunderstanding of how scientific names and species identifications work. I know of a couple folks who refuse to call the species formerly known in the hobby as “B. smithi” the correct name of “B. hamorii.” Still, it’s important for folks to understand and appreciate that a name change, although jarring and confusing at first, is a sign that these creatures are getting much needed attention from taxonomists and the scientific community. I would encourage anyone interested in this change to read the accompanying paper. Along with the reclassification of these two species were a couple other very interesting informational nuggets. These will be the first two Homoeomma species to be found in the country of Chile. Previously, this genus was known to be found in Brazil, Uruguay, Colombia, Argentina and Peru. In the wild, H. chilensis was found in shallow burrows beneath rocks and under tree trunks. Burrows were generally no deeper than around 5 cm. They were observed eating ground beetles, wasps, and other spiders. Possibly the most interesting revelation is that H. chilensis adults were found to occupy burrows in close proximity to other adults, sometimes mere centimeters apart. One particularly fascinating photo included in the papers shows three burrows in about a 1 square foot area. Generally, once a paper is widely accepted, the changes will be reflected in the World Spider Catalog . Those who want to follow the progress of this new development will want to check in there.